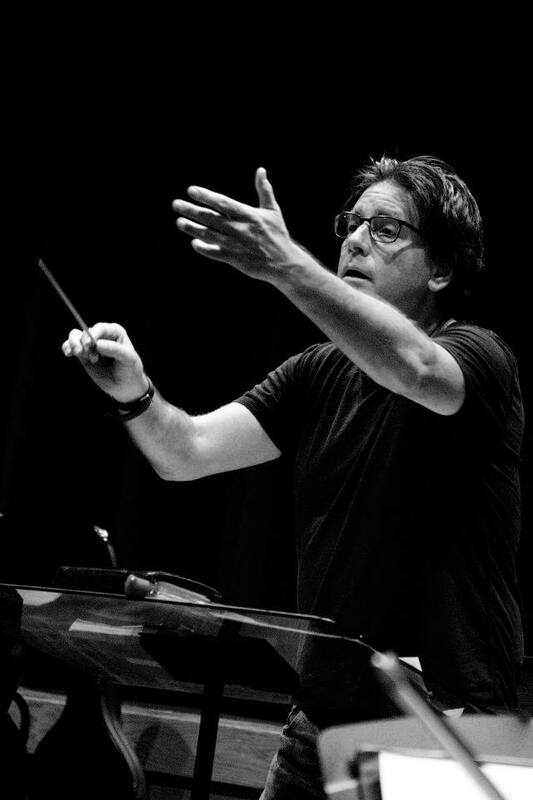 The Los Angeles Youth Orchestra, conducted by Founder and Artistic Director Russell Steinberg, performs on Sunday, April 14 at 4:00pm at UCLA Schoenberg Hall, Monday, April 15, 2019 at 7:30pm at the Ambassador Auditorium in Pasadena and Wednesday, June 19 at 7:30pm at Walt Disney Concert Hall. The Symphony Orchestra performs the complete Brahms Symphony No. 4, the last symphony Brahms composed and the world premiere of Russell Steinberg’s Cosmic Dust 2. The Ruth Borun Concert Orchestra performs the first movement of Haydn’s late Symphony No. 99 as well as two dances from Isaac Albeniz’s Suite Espanola, and the tune made famous by the old TV show Alfred Hitchcock Presents, Funeral March of a Marionette by Charles Gounod. Conducting Intern Samuel Chung will lead the Ruth Borun Concert Orchestra in an arrangement of Brahms Academic Festival Overture. 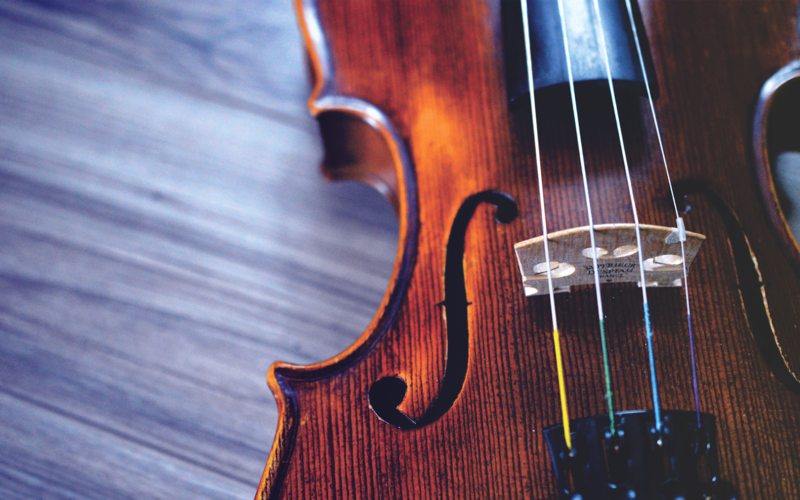 The Contemporary Adventure Ensemble (CAE) combines Los Angeles Youth Orchestra alumni and current advanced students with top professional musicians playing contemporary chamber and chamber orchestra music. This concert features Brightwork newmusic as artists-in-residence along with mezzo soprano Geeta Novotny; LAYO alums Kris Rahamad, Alisa Luera, and Jermaine Paul; and current LAYO students Clara Ross, Oliver Marcus, Riley Scaff, Himalya Joshi, Ryan Zaid, Margaret Forth, Jared Bishop, Chloe Brill, Ranya Stover, Roshan Chhetri, Ayden Chi, Lydia Kresin, Evan Diaz, and Allana Taghioff. The ensemble will perform Quartet No.1 by Villa Lobos, Scale 9 by Sean Friar, Quartet No. 8 by Shostakovich, Rucksack by Russell Steinberg with Geeta Novotny, mezzo-soprano and a chamber version of Appalachian Spring by Aaron Copland. Tickets are $25 and available on eventbrite. 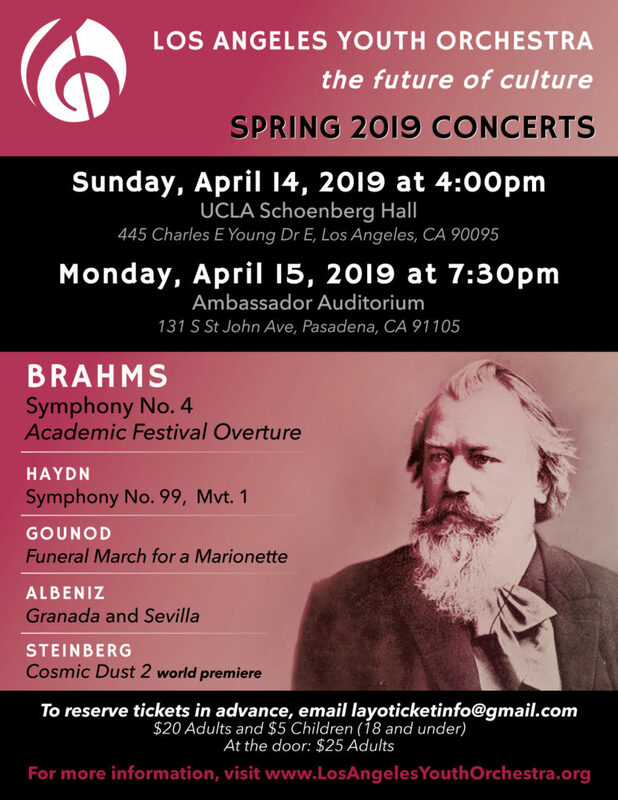 Ticket reservations for our concerts on Sunday, April 14 at 4:00pm at UCLA Schoenberg Hall and Monday, April 15, 2019 at 7:30pm at Ambassador Auditorium can be made starting Sunday, March 31 at 12:00pm. Reserve your tickets in advance by emailing layoticketinfo@gmail.com. In your email, please include the date of the concert and name of venue, type of ticket (adult or child 18 and under) and number of tickets. Payment can be made in-person at the rehearsals or concerts by cash, check or credit card (Visa, Mastercard or American Express). Parking Lot 2: From Hilgard Ave., enter the east side of the campus at Westholme Ave. An immediate left turn leads to Parking Structure 2. From Structure 2, walk north along Charles E. Young Dr. East to Dickson Plaza. Enter Schoenberg Hall from Dickson Plaza. From the West on the Pasadena Freeway (110): Exit at Orange Grove Blvd., go North (turn left) and proceed six traffic lights to Green Street. Turn right onto Green Street and park on the street, or go on Green St. and turn right onto St. John Ave. and park on the street or in the parking structure. From the East on the Foothill Freeway (210): Exit at Orange Grove Blvd. via the Ventura Freeway (134). Go South (turn left) on Orange Grove, then turn left at the second traffic light onto Green Street and park on the street, or go on Green St. and turn right onto St. John Ave. and park on the street or in the parking structure. From the Ventura Freeway (134): Exit at Orange Grove Blvd. and proceed straight onto Colorado Blvd. Turn right at the first traffic light onto St. John Ave., and park on St. John, in the parking structure, or circle the campus and park on Green Street. From the North on the Foothill Freeway (210): Take the Colorado Blvd. exit, proceed straight onto St. John Ave., and park on St. John Ave., in the parking structure, or circle the campus and park on Green Street.